This Apprenticeship is a three day intensive program where each student whether being a novice or a seasonal investor will learn the fundamentals of investing in real estate with minimum liability and maximum profitability. This apprenticeship is designed with the combined experience of 50 years of real estate investing where you will learn over 80 different strategies/techniques, and over 12 no money down secrets through a hands on, in the trenches approach to learning. It is proven that the best way of learning is not by reading, or by audio/video but through hands on training where one can retain up to 90% of information. The Real Estate Millionaire Strategies Apprenticeship (REMSA) will begin by teaching you the basics to very sophisticated investing tools and techniques which can empower you to start making money up front instead of by using the conventional way which involves risks and opens you to be subject to the ups and downs of the market. 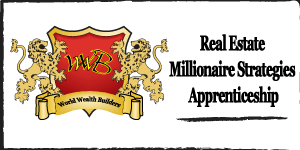 At World Wealth Builders, we have taken out the words “speculation”, “gambling”, and “risk” completely from this apprenticeship, and provide a positive, optimistic and legal way to make large income. The Non-Requirements for REMSA For you to attend the REMA, you DO NOT need to have: 1. Good credit. 2. A full time job. 3. Large capital. 4. Any qualifications or educational background All you need is the determination and desire to learn and achieve your goals. You will start using the knowledge you have obtained in this apprenticeship the minute you step out of the room. Once you finish the apprenticeship, networking and support will be provided to you to ensure your continued success. We already have an exclusive network of over 4300 Canadian Real estate investors from coast to coast which will be at your disposal. How will this Apprenticeship Benefit me? There will be teleconferences, webinars and networking meetings held to enhance your acquired skills and knowledge. During the REMSA, there will be no case studies instead, there will be calls coming from panic property sellers where you will learn how to handle the calls, write up an offer and complete the transactions professionally. Each student will be given a very special package called “marketing on steroids” which will help you gather all the necessary leads before you start your apprenticeship. This is the most powerful real estate investors’ training/seminar /boot camp where you will be armed with education, knowledge and networking abilities. Thank you all who participated to make this wonderful course a huge success! This training is great, very different from other training, since it has lots of real life examples, visit in the field, talk to people who need our help because they were kicked out of the house or have no money. We also do field visits & talked to motivated sellers. Our master mentor, Navtaj showed us how in a few words to sellers open up to give us lots of information so that we can use for the best of everyone involved in the deal. We got lots of useful information from the trenches that can be applicable right away, the great part also we listened to the calls conversation about how to talk to a homeowner who does need our help! All the information is applicable in real life as myself I am an alumni & I successfully applied it, so did others who came to teach! It is the perfect course to get the knowledge & apply it. All you have to do is follow Navtaj's instructions! In addition to these easily applicable techniques and other information, I have also gained some incredible contacts. I am also a hard money lender, but the security on my investments in the past has been somewhat suspect. Now I have the ability to advance funds, with the protection of real estate (mortgage on the property), that I did not have before.